What’s so Magical about the #MagicBand? What’s so Magical about the Magic Band? When you book your Disney Vacation at Walt Disney World you will receive a Magic Band. I highly recommend you order at least 10 days before your vacation and pick the color of your choice. That way you can customize your band and they will be delivered to your house. Predictably I waited too long to order and had to pick my Magic Band up at the resort. Also, I ignored the email that asked me to customize so I my Magic Band was “I forgot to choose a color grey” also known as iconic gray. Prepared guests can choose from red, yellow, pink, blue, orange, green as well as iconic gray. 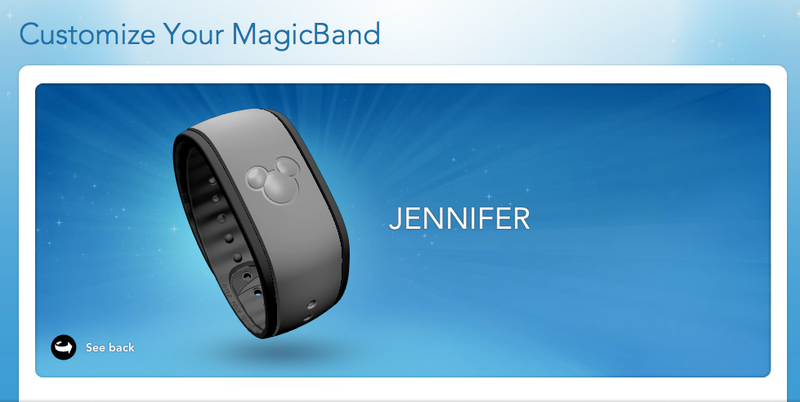 In addition you can choose a name to be printed on the inside of your MagicBand. If you don’t choose a name they just use the first name from your reservation. The Magic Bands are your key to the Walt Disney World Kingdom. Magic Bands are waterproof bracelets that you wear on your wrist for the duration of your stay. They have several functions. They are pretty magical and once you get the hang of matching the icon up with the sensor they work really well. It makes life at Disney World Parks and Resorts very simple since everything works with the MagicBand. The technology is amazing and I never saw anyone have a problem with the MagicBand during my stay. The only drawback I saw when I was in Disney World in the spring is that with the introduction of the MagicBand not many people were wearing lanyards. No tickets no reason for a lanyard. My family and I are big in to pin trading and we loved wearing the lanyards and trading pins with the Cast members. It was a big Disney tradition for us and I am afraid that MagicBands might mean the death of pin trading. Although, every Cast member I asked assured me they were still supposed to wear their pins daily for trading, I just don’t forsee Pin Trading lasting much longer. We are heading back to Disney in August and the kids were psyched to customize their MagicBands. And yes we did it early enough so they should be delivered any day now. I decided to pass up on iconic gray and go classic Disney red & black. Can’t wait for them to arrive!